Once you enter Kilwins old-fashioned confectionary shoppe, you’ll be greeted and offered a free sample of our hand-paddled fudge. You’ll also be able to watch as our expert cook makes caramel corns, brittles and other tasty treats in our kitchen. Smell the aromas from the copper kettle and from the hand-made waffle cones. Cool down with our Original Recipe Ice Cream – with 28 flavors to choose from, it’s easy to find something you’ll enjoy. Scan the chocolate cases and be amazed at the variety of our hand-made confections, from chocolate-covered pretzels, krispie treats, and marsh-mallows. You’ll also love our fine truffles, creams and toffee bars. 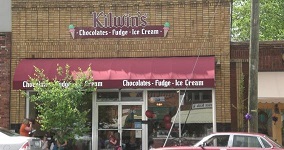 Kilwins is a feast for the senses!